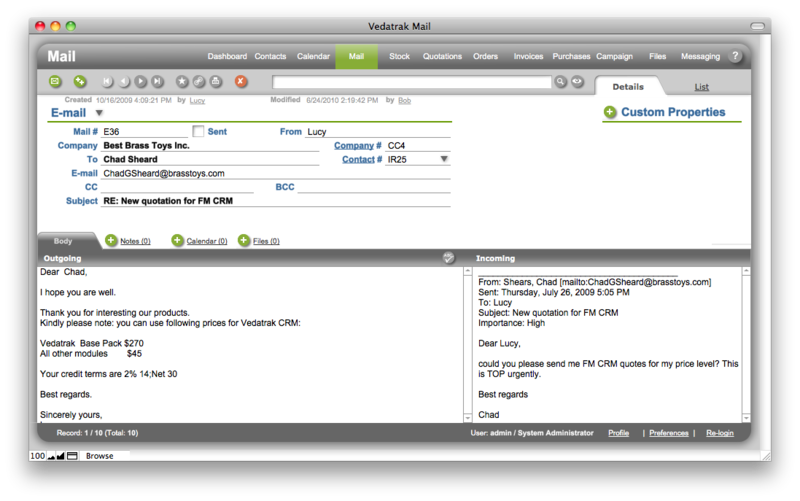 Vedatrak Mail, a module for Vedatrak FileMaker CRM. Track and organize e-mail, mail and fax correspondence. The Mail module helps track and organize e-mail, mail and fax correspondence. A correspondence history for each contact is available to every team member. Messages can be grouped or filtered by topic to track specific conversations. Since all correspondence with clients, leads and vendors is carried out in the Vedatrak, all e-mails, letters and faxes are automatically stored for future reference. All e-mails, letters and faxes are stored within the contact's card. All messages can by filtered by keyword to track specific conversations. ** If you already purchased Vedatrak Mail 2.1 and want to upgrade to version 3.1, you will be offered a special upgrade price. System will automatically check Your Downloads and define if you're performing an upgrade. Purchasing a support package in conjunction with Vedatrak Mail will enable you to rest assured that all technical aspects of using our product will be handled so you are free to provide you or your team with the professional support to effectively use it.